The top professional boxers in country are set to pack a punch when they take to the ring in 'IndiaBulls Rajasthan Rumble' fight night in Jaipur on December 23. The star studded lineup shall be spearheaded by undefeated professional pugilist Vijender Singh who shall be putting his double titles against African Champion Ernest Amuzu. Besides Vijender, Commonwealth Games bronze medalist Amandeep Singh and two times Asian Boxing champion Kuldeep Singh will also featured in the six all-Indian undercard bouts. IOS Boxing Promotions on Thursday announced its complete fight card for the much-awaited fight night 'IndiaBulls Rajasthan Rumble' scheduled to happen at Sawai Mansingh Indoor Stadium in Jaipur on December 23. 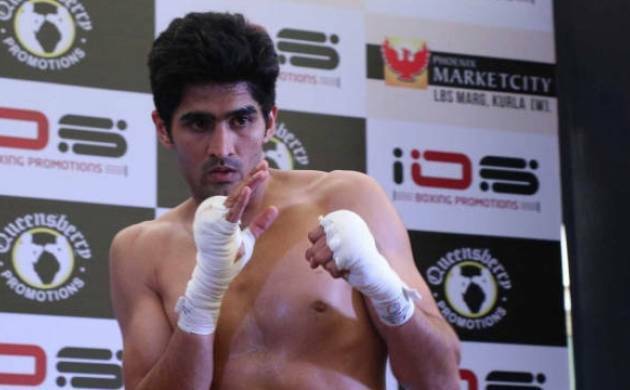 Indian boxing sensation Vijender Singh will take on African Champion Ernest Amuzu from Ghana for defending his two titles WBO Asia Pacific and WBO Oriental Super Middleweight. The 'Rajasthan Rumble' will also see participation from other young talented boxers like Pardeep Kharera, Kuldeep Dhanda, Dharmendra Grewal and Asad Asif Khan. Key boxer Amandeep Singh (Bantamweight - 55.5 kg) will take on 24-year-old Manoj Kumar from Punjab in a six-round contest, who has got a bronze medal in the 1st Elite Senior Men Boxing Championship in 2017, and also bagged another bronze in the Junior National Championship. In another bout, Kuldeep Singh (Heavyweight 93.4 Kg) will face Amrinder Singh from Haryana. Amandeep from Punjab, made his professional debut in 2016 against Sunil Sharma in Delhi. The Commonwealth Games 2010 bronze- and Asian Championship gold- medallist has fought two bouts so far and won both of them with the second one knockout against Pakpoom Hammarach of Thailand. Commenting on the fight card, Neerav Tomar, Promoter IOS Boxing Promotions, said, "In the last three fights we have included international stars in our fight cards but with the original vision to promote boxing in India, this time we wanted to give chance to our young Indian talented boxers and that's the reason that except Vijender's opponent all the boxers and their opponents are Indians. We are looking forward for delivering a quality show in Jaipur." In another fight for Super Bantamweight 61.2 weight category, Asad Asif Khan from Kolkata, who holds a record of 2-2-0 will take on Bhiwani boy Sunil Siwach in a four-round contest. Kuldeep Dhanda will face 24-year-old Fateh Singh from Delhi in a four-round contest in the Lightweight (61.2kg) category while Dharmender Grewal will face Harsh Nagar from Mumbai in a six-round contest, in the Cruiserweight category (90.7kg).